Here is an explanation of ATEX and IECEx standards, markings, classification, directive and different zones. ATEX products are differentiated from standard products by their markings, most noticeably the recognised Ex symbol. 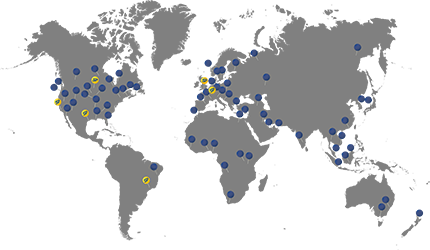 Under The ATEX and IECEx schemes, products are classified and marked to show the areas in which they can be used, and the level of protection employed. ATEX – II 1 G where: Equipment Group II is for use in all other areas other than mines. Category 1 for use Zones 0, 1 and 2 for gases/vapours. Environment G for use in hazardous gas, vapour or mist environments. Type of Protection ia is Intrinsic Safety. Gas Group IIC is gas, vapour or mist, except in coal mines. Equipment Protection Level Ga – suitable for use in Zones 0, 1, 2. 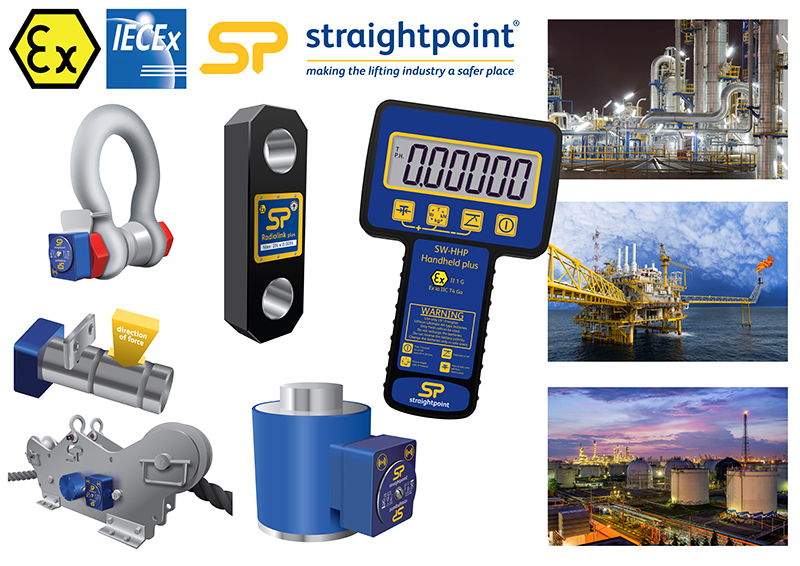 Actual Straightpoint markings form part of the labels affixed to the ATEX/IECEx wireless loadcell products and held hand display unit. controlled conditions. Compliance has to be verified by recognised third party professional bodies. In the EU, the ATEX Directive defines technical and management systems requirements for compliance. In the USA and other international regions, similar requirements are specified by the IECEx scheme. There is an accelerating growth rate for ATEX/IECEx approvals, principally driven by the upward demand for energy and growth amongst developing and emerging economies, and their increased awareness of the need for “Proof ofCompliance” with minimum safety standards. spreads to the entire unburned mixture. temperatures of –20°C to 40°C and pressures of 0.8 to 1.1 bar. Organisations that operate within these and other industry sectors are obliged to assess their business activities to identify potential explosive atmospheres and to implement control measures to reduce the possibility of inadvertent explosion. Measures include using only Ex approved equipment. In the EU, this is a legal obligation. ATEX is The European Regulatory Framework for Manufacture, Installation and Use of Equipment in Explosive Atmospheres (denoted by Ex). It came into force in 2003, and was enacted in the UK by statutory Instrument (SI) 2002: 2776. It was called DSEAR (The Dangerous Substances and Explosive Atmospheres Regulations of 2002), and implemented both the ATEX and the Chemical Agents Directive (98/24/EC). The name ATEX comes from the French title of the 94/9/EC EU Directive: Appareils destinés à être utilisés en ATmosphères EXplosibles, which is concerned with explosive atmospheres. IECEx is the International Electrotechnical Commission Scheme for Certification to Standards Relating to Equipment for Use in Explosive Atmospheres. ATEX is driven by EU law whereas IECEx is a voluntary certification scheme. Both however, provide an accepted means of proving compliance with IEC standards. The difference between ATEX and IECEx is initially that ATEX is only valid in the EU and IECEx accepted globally. EU Directive 1999/92/EC, also known as the ATEX Directive, and commonly referred to as the Workplace Directive, sets out the responsibilities of the employers (Not manufacturers) for implementing minimum health and safety requirements for the protection of employees at risk from explosive atmospheres in the workplace. Zone 2 – where an explosive atmosphere is unlikely, but where it does occur, that it will only exist for a short period. These are for gases/vapours. There are similar zones 20, 21 and 22 for dusts. Once zones have been identified and classified, any equipment with a potential ignition source (electrical and nonelectrical) must comply with the EU Directive EU 2014/34/EU (which replace the previous Directive 94/9/EC in April 2016) relating to each of the zone classifications in which it is being used. Maintaining records relating to the risk assessment/zone classification, inspections, training and other pertinent records. Both ATEX and IECEx both require compliance with the same technical standards, so in terms of technical content, there is basically no difference. Only visible difference is in many cases the marking on the device. IEC (The International Electrotechnical Commission) Standard IEC 60079 is a suite of Standards that cover a wide standards relating to different types of equipment and protection measures in explosive atmospheres. This Standard specifies the construction and testing of intrinsically safe apparatus intended for use in an explosive atmosphere and for associated apparatus, which is intended for connection to intrinsically safe circuits which enter such atmospheres. This type of protection is applicable to electrical equipment in which the electrical circuits themselves are incapable of causing an explosion in the surrounding explosive atmospheres. This Standard contains the specific requirements for construction and assessment of intrinsically safe electrical systems, type of protection "i", intended for use, as a whole or in part, in locations in which the use of Group I, II or III apparatus is required. This standard supplements and modifies the general requirements of IEC 60079-0 and the intrinsic safety standard IEC 60079-11. ISO/IEC 80079-34:2011 specifies particular requirements and information for establishing and maintaining a quality system to manufacture Ex Category 1 and Category 2 equipment including protective systems in accordance with the Ex certificate. It is compatible with the objectives of ISO 9001:2008. Compliance with this standard is required before ATEX/IECEx can be manufactured for sale into the market place.